When I first got my Revenge From Mars from a local Pinhead; the fan was clogged with dust and grime. At the time; I simply cleaned the fan, removed the sticker, and added some oil to the bearings. This lasted about 3months before the fan began to make some horrible noises because the bearings were shot. I “lived with it”; but it remained on my todo list. 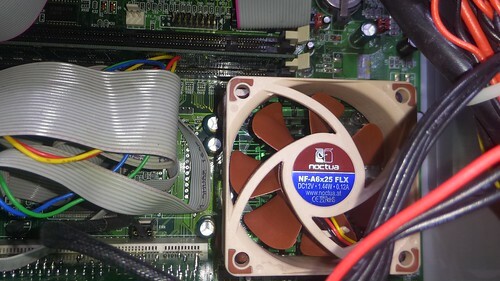 For years; I had watched threads about Pin2k in Pinside… always feeling a little guilty I had not eliminated the risk that my CPU fan would die… overheat the cpu… and put my RFM in jeopardy of force converting to NuCore or Pinbox. Today was the day I vowed to resolve that noisy fan. 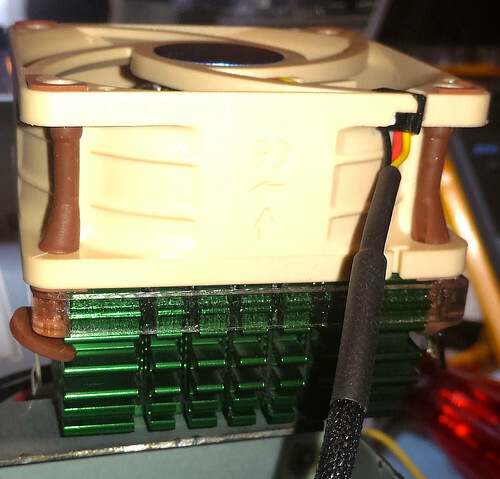 and build an adapter to fit the larger fan over the existing heatsink. This blog entry documents my solution, provides a TAPR/NCLed DXF for my adapter, and links to a Shapeways implementation of my adapter my fellow pinball enthusiasts to use. 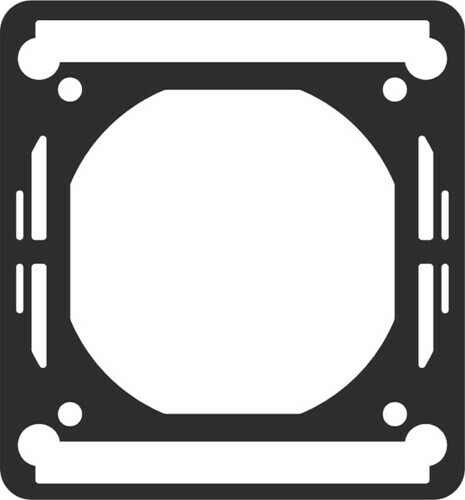 I need the heatsink to take caliper measurements in order design a 60mm to 50mm bracket. 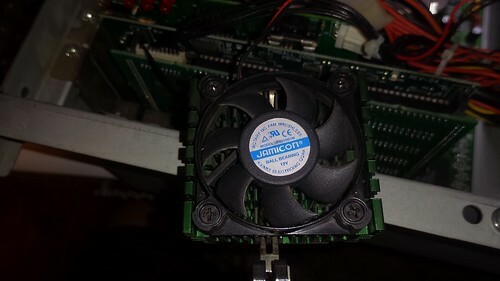 Eventually; I’d toss the worthless 50mm fan – but wanted to keep it incase I couldn’t find a working solution. Reusing the 4 qty 50mm countersunk heatsink screws; I attached the clear acrylic bracket to the top of the heatsink. Then I put the 4 qty Vibration-Compensators provided in the Noctura kit thru the acrylic bracket and into the NF-A6x25 fan. The whole assembly fit together quiet nicely. 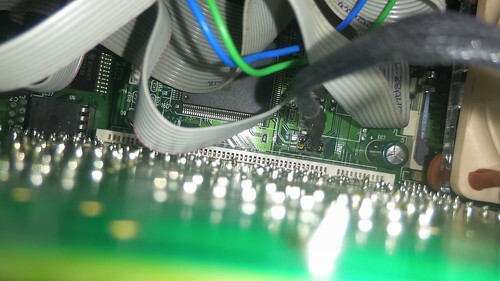 I powered up the Pin2k system on my bench with both the original and the new fan connected. !That old fan really needed to be replaced! This new fan is ultra quiet; I don’t think you can hear the fan over the PSU fan even when the box is open. You won’t be able to hear the fan at all when its in the backbox behind the backglass. Success! You may make products based upon this design, provided you do not make more than ten units in any twelve month period for your personal use. This entry was posted in Arcade, CAD, Design, DIY, NCL, Pinball, qcad, TAPR and tagged 3D Printing, arcade, modification, Pin2k, pinball, Pinball 2000, RFM, WMS. Bookmark the permalink.